Light weight, portable and easy to use wrist blood pressure monitor for managing hypertension or general wellness. 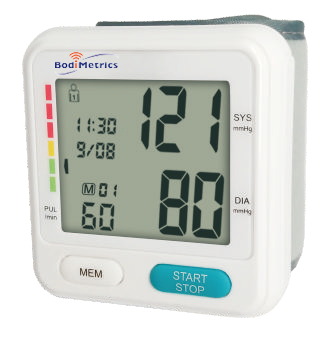 The blood pressure monitor uses Bluetooth to synchronize with the BodiMetrics™ Performance Monitor or VitalsRx Monitor or coming soon standalone with our free mobile app. Uses: This wrist blood pressure monitor is intended to be used to measure blood pressure and pulse rate from the wrist by using the oscillometric method, at home. This device is intended for use on adults only and is not for use on groups such as neonatal babies, children, pregnant women, or pre-eclamptic patients. Indications: When systolic and diastolic pressure fall into different categories, the higher pressure determines color code. Blood pressure measurements determined with this device are equivalent to those obtained by a trained observer using the cuff/stethoscope auscultation method, within the limits prescribed by European Society of Hypertension International Protocol revision 2010 for the validation of blood pressure measuring devices in adults. 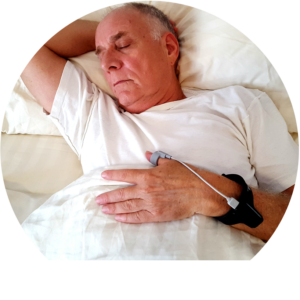 An irregular heartbeat (IHB) rhythm is defined as a rhythm that is more than 25% slower or 25% faster from the average rhythm detected while the device is measuring the systolic and diastolic blood pressure. When the device detects an irregular rhythm two or more times during the measurement, the Irregular Heartbeat Symbol will be displayed with the measurement values.